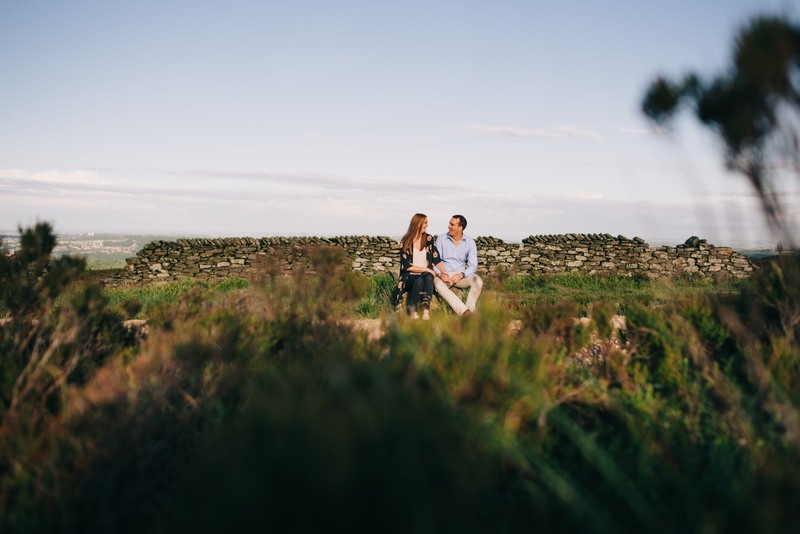 It’s hard to believe, but an hour before I met up with Hannah and Peter for this engagement session, we’d had a chat on the phone and agreed to postpone until the following morning. Unusually for the summer we’ve had, it was raining so heavily I was eyeing up the planks of wood in the garden and considering grabbing a saw and making them Ark shaped. But then the clouds rolled past and out came the sun. A quick follow up call and we were back on. So, it was high up above Sheffield, on the Peak District side, where I met Hannah and Peter at Houndkirk Moor which has some really lovely areas to explore; from tree lined tracks to the heather moorland looking down over the city. We didn’t quite make either of the downhill mountain bike tracks on our wander (I think Peter’s more of a roadie anyway) but before the midges descended we had fun capturing some great images. Hannah and Peter were already familiar with my photography approach, as I’d had the pleasure of working with them when Hannah was bridesmaid for Samantha at her wedding in 2016. Can’t wait to capture the big day at Losehill House next month!